Toronto: Congratulatory messages have been pouring in from across Canada to fellow Lohana Ramesh Chotai, the co-founder and past chair of Canada India Foundation on being awarded the prestigious Pravasi Bharatiya Samman Award, the highest civilian award bestowed upon overseas Indians by the Government of India. 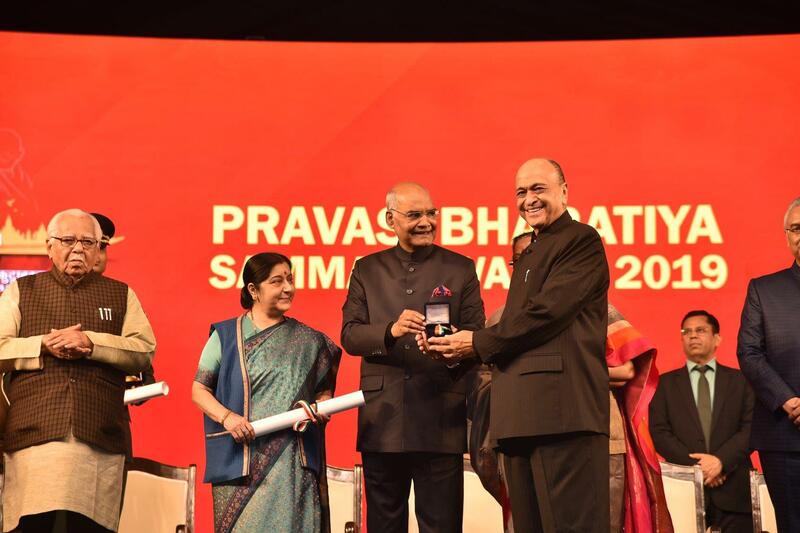 Ramesh bhai was honoured with the award by the President of India His Excellency Ram Nath Kovind at a glittering ceremony on 23 January, the concluding day of the Pravasi Bharatiya Divas, the annual conglomeration of the Indian diaspora, held this year in the holy city of Varanasi, India. India’s Minister of External Affairs, Hon. Sushma Swaraj; the Chief Minister of Uttar Pradesh Hon. Yogi Adityanath; and the Governor of Uttar Pradesh, Hon. Ram Naik, were present at the award presentation ceremony. The Pravasi Bharatiya Samman (Overseas Indian Honour/Award) is an award constituted by the Ministry of Overseas Indian Affairs, Government of India in conjunction with the Pravasi Bharatiya Divas (Non-Resident Indian Day), to honour exceptional and meritorious contribution in their chosen field/profession. 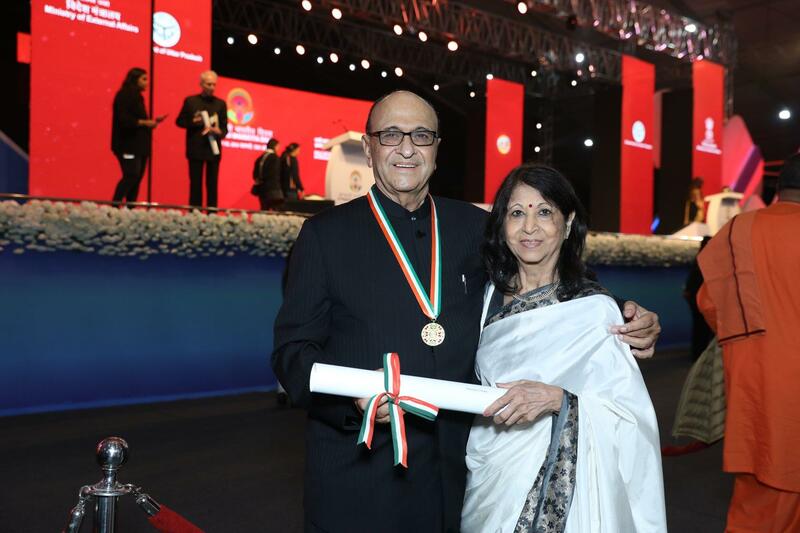 The Award carries a bilingual Sanad under the hand and the seal of the President of India in addition to a citation and a gold medallion. Mr. Chotai received the honour in category of philanthropy, business and promoting Canada – India relations. Mr. Chotai is the President of Bromed Pharmaceuticals, one of the leading pharmaceuticals companies in Canada, bringing employment to several individuals and one of the leaders in pharmaceutical formulation technology. He was CIF’s Chair during 2009-2011 and under his leadership, many strategic initiatives were organized such as Canada India Energy Forum and Canada India Mining and Metals Forum. He was also member of two delegations led by Premiers of Ontario to India. He was also the Co-chair of Canada India Health Care Summit which was held both in Canada and India. Mr. Chotai pursued his education as Pharmacist in the UK and Switzerland and joined ICI Pharmaceuticals in Kampala, Uganda. He came to Canada in 1972 as a refugee. Starting as a Pharmacist/Manager at an Oshawa Pharmacy, he has built a successful group of companies that manufactures and distributes medical and healthcare products around the world. A prominent community builder and a philanthropist, Mr. Chotai is the past President of the Hindu Mandir and Cultural Centre, the Vice-Chairman of the Canadian Museum of Indian Civilization, the President of Vraj Canada Community Centre and Canada Serves, and a former President and current Advisory Board Member of the Indo-Canada Chamber of Commerce. He has received many awards from the Government of Ontario and various community organizations. In 2001, Mr. Chotai was instrumental to raise $1.6 million in three weeks for Gujrat Earthquake relief and it created a partnership with Canadian International Development Agency (CIDA) to match $3.2 million to build 802 homes, 32 schools, 4 community center and four medical mobile clinics in the earthquake-ravaged areas in Gujarat. Mr. Ramesh Bhai Chotai, we salute your endevours and are proud to call you a fellow Loahana!